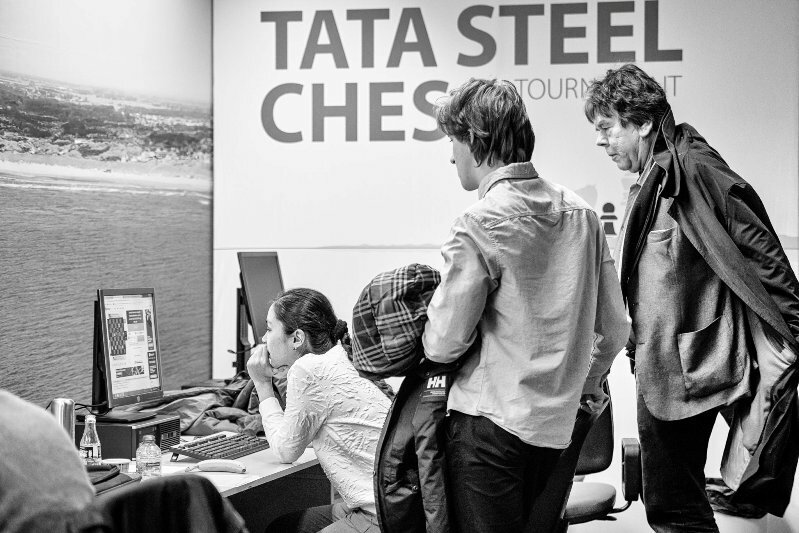 Ian Nepomniachtchi is now the sole leader of the 2019 Tata Steel Masters after taking full advantage of another meltdown by former World Champion Vladimir Kramnik. 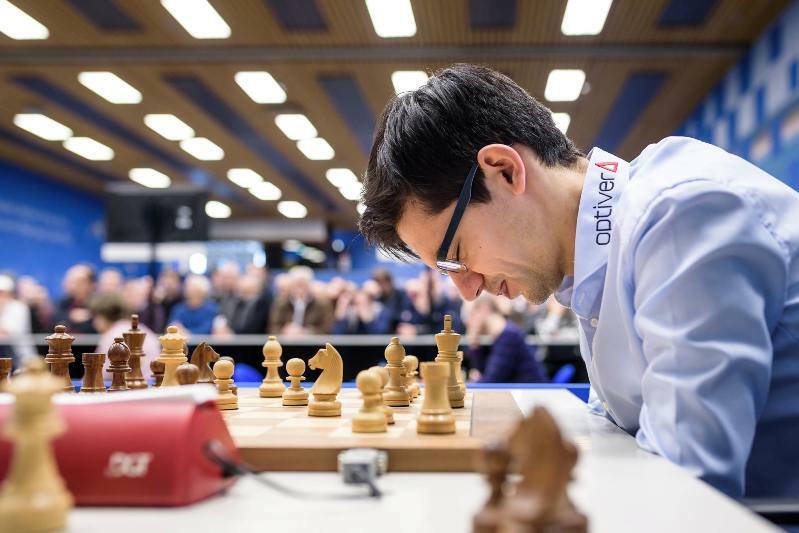 The day’s other winners were Jan-Krzysztof Duda, who bounced back to beat Vladimir Fedoseev, and Ding Liren, who unleashed some powerful preparation on Jorden van Foreest. 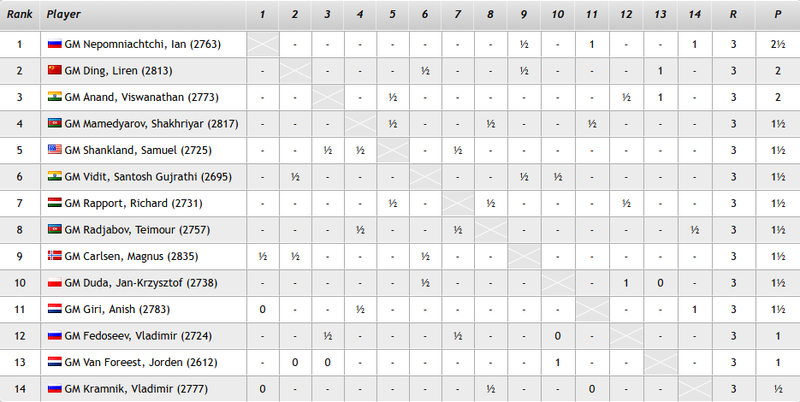 The other games were drawn, including a 20th classical draw in a row for Magnus Carlsen, who spent 131 moves and 6.5 hours trying to grind down Vidit. Up next for the World Champion? White against Kramnik! This time none other than Magnus Carlsen was to blame for another 7-hour show for our dynamic duo of Jan Gustasfsson and Peter Svidler! 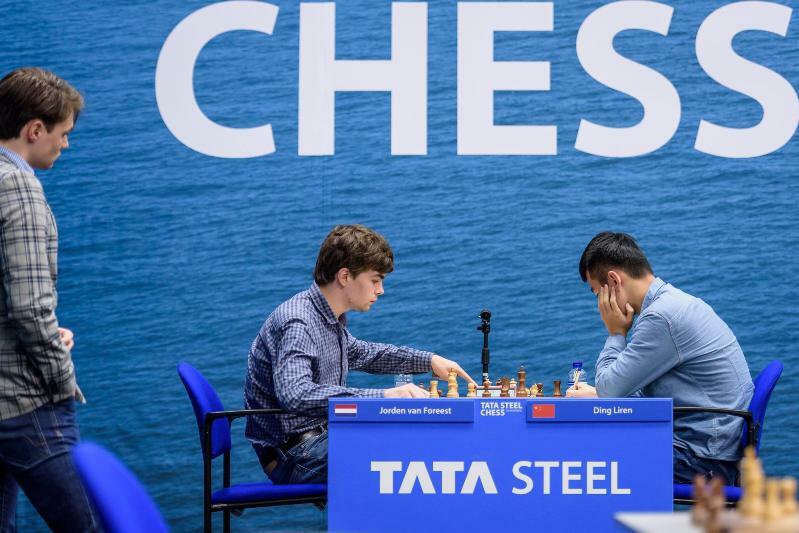 Ian Nepomniachtchi was upset when he first saw his pairings for the Tata Steel Masters – Black in two of the first three games, against the players who tied for first last year, Giri and Carlsen, then White against former World Champion Vladimir Kramnik. It couldn’t have gone better, though, with Ian now the sole leader of the tournament on 2.5/3 and up to world no. 8. After both players who lost in Round 1 won in Round 2 it was Jan-Krzysztof Duda’s turn to make a comeback in Round 3. 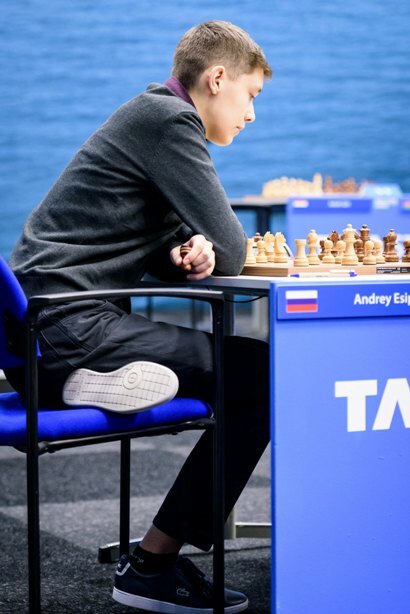 The seeds of his success were sown in the opening, where Vladimir Fedoseev spent 11 minutes on move 7 before going for a dubious pawn capture, only to then take half an hour on his 9th move. By move 10, probably with a heavy heart, he’d taken the decision to play 10.Na4!? even though it ran into 10…Qa5+! 11.Bd2 would be hit by 11…Bxf2+!, winning a pawn and leaving the white king position in tatters. Instead of that Fedoseev went for 11.Kf1! ?, the alternative to which was to admit that his last move had been unwise and reverse it with 11.Nc3. This was the subject of “Story time with Peter Svidler”! 22…h5! was soon followed by pushing the pawn to h4, and when Vladimir went astray Duda’s ambition was richly rewarded, even if his opponent was giving nothing away! 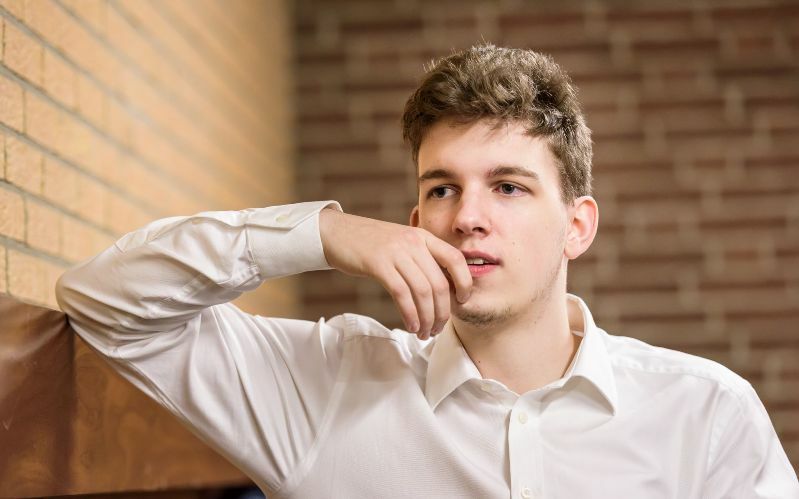 I really liked today’s game because Fedoseev was, probably still is, a very hard opponent for me, because he’s super aggressive and besides it he’s got a poker face – no emotions at all. In the end there was a forced checkmate with g5, but he still didn’t show anything. Three of the four draws were relatively short in drama. Anish Giri had been the player to spoil Shakhriyar Mamedyarov’s fine start a year ago when he caught him out in the opening. This year the roles were reversed, as Shak played the new move 15…Rb8 in a Grünfeld and took no more than 29 seconds on a move before move 26. The pause came because Giri hadn’t played the best 26.Be5, “a forced line where Black is escaping narrowly”, but 26.Re4, “a line where he escapes less narrowly”. As Giri explained, it made no difference! 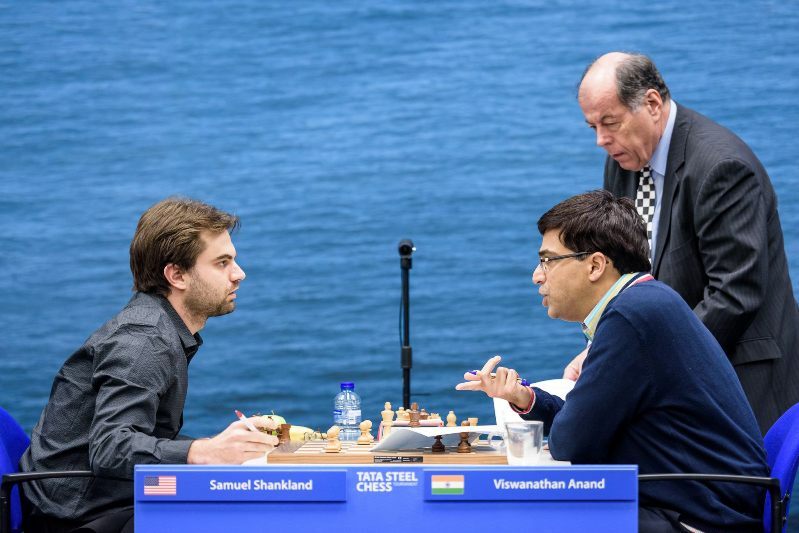 Shankland-Anand was a Queen’s Gambit Decline where Sam continued to impress by applying pressure to his formidable opponent, but Vishy safely steered the game towards a draw. Radjabov-Rapport featured a Taimanov Sicilian where Teimour Radjabov carefully ensured Richard Rapport would get no chance to light any fires. That leaves the epic Vidit-Carlsen, which logically might have finished almost 100 moves earlier if not for 35.g4!? 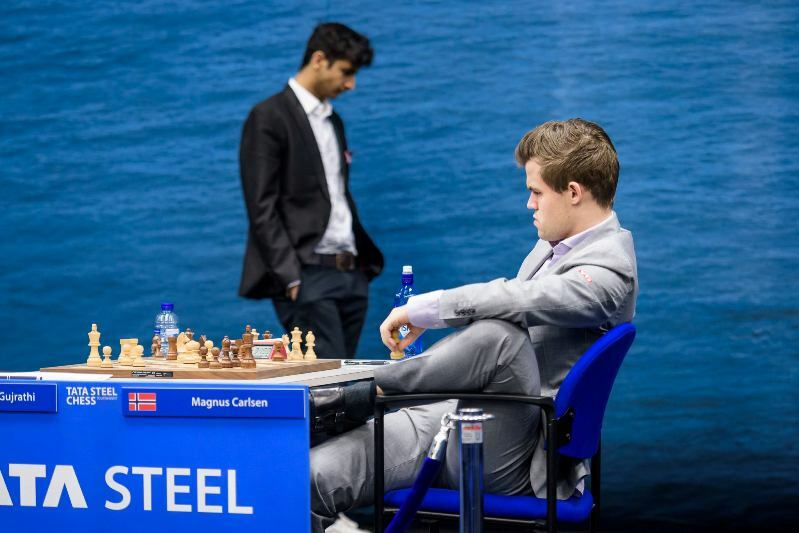 Carlsen: I think his move g4 was quite unnecessary… He played g4, which gives me some kind of a target. Vidit: I knew that if I lose this game I’ll look really retarded, because 35.h4 is a theoretical draw and everyone knows it, but I thought I’m forcing a 3 vs 3, but after 35…f6 I get 4 vs 3… a good version for him. At some point I had to find accurate moves to hold, so it was really unpleasant. Vidit admitted he thought he was simply losing at some point after that, until he found 48.f3! Work a little harder tomorrow, don't peter out after 128 moves, push the guy to the bitter end! 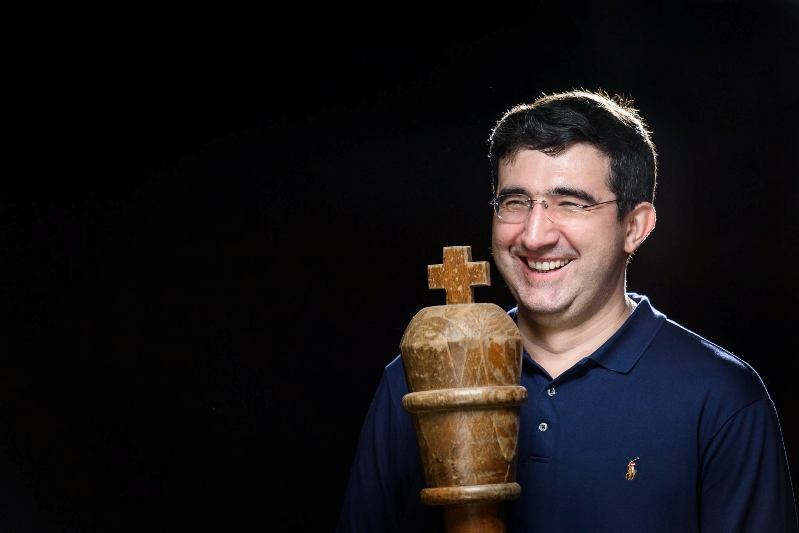 And the good news is he's playing a guy who usually does the pushing himself - Vladimir Kramnik. There’s some added spice to the contest, since the three draws so far have also left Magnus within 3.8 points of ending over 7 unbroken years as world no. 1 on the live rating list. If he did lose to Kramnik Fabiano Caruana might be very pleased with his life choices this January! 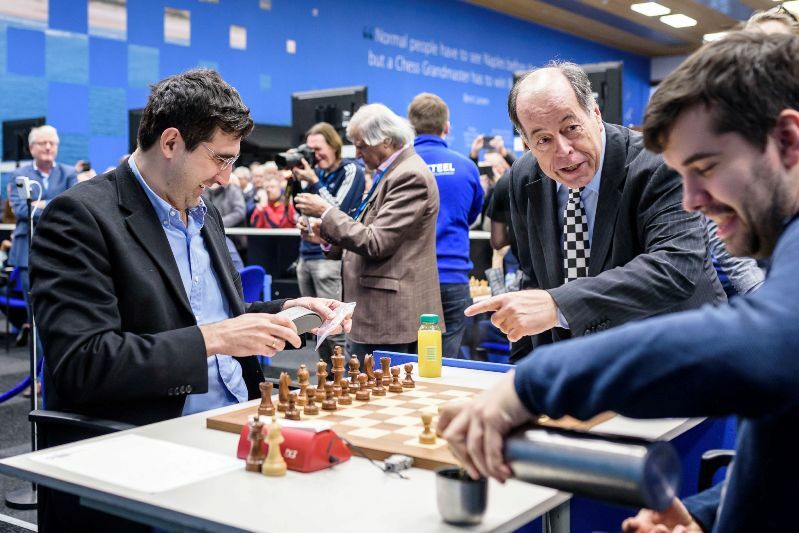 It’s not just the Carlsen-Kramnik clash we have to look forward to in Round 4, since the player with White in 6 of the 7 games has a rating advantage – usually a recipe for decisive results as they try to make that advantage count.